Please visit us at Booth #D141 (Hall 7) to learn more about how our innovative enzyme, probiotic, and betaine feed technologies are helping meet performance, profit and planet challenges of animal producers. Feed to Food brings together supply and demand within the complete animal protein chain. The driver behind the chain concept is that animal feed and animal health are vital for meat quality and safety. VIV MEA will represent every step in the meat-, seafood and dairy production process. 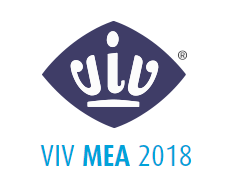 With over 300 international exhibitors, VIV MEA offers a unique selection, compromising global market leaders. At VIV MEA, suppliers from all segments of the Feed to food chain are represented. From suppliers of feed (ingredients) and animal health, to equipment for breeding, farming, slaughtering & processing.